Brown Rice: Super Food! White Rice: Not So Much. Brown rice is a super food. Many of us forget how incredibly different the nutrient profiles are for white versus brown rice. We all know that a slice of white sandwich bread is much lower in nutrients than say a hearty whole wheat slice of bread. But we forget that the nutrients in rice is also highly affected by the color your choose! Sometimes people actually think white rice is a 'health food'. When in reality, it is incredibly similar to the dreaded-by-dieters ingredient: 'white flour'. True, white rice has more water content (better for hunger satisfaction) and is less pulverized than flour grains, but the nutrient degradation of the grain is very similar. Fast Tip: When faced with the white versus brown rice decision, think of it in the same way you do white versus whole wheat bread. Choose brown rice for health, and a hearty nutty taste. Choose white rice as a sometimes food, with no considerable nutrient benefits. 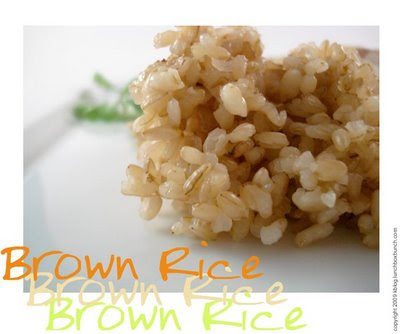 Brown rice is packed with healthy nutrients including manganese, selenium, magnesium and B vitamins. "Our food ranking system qualified brown rice as an excellent source of manganese, and a good source of the minerals selenium and magnesium. The complete milling and polishing that converts brown rice into white rice destroys 67% of the vitamin B3, 80% of the vitamin B1, 90% of the vitamin B6, half of the manganese, half of the phosphorus, 60% of the iron, and all of the dietary fiber and essential fatty acids. By law in the United States, fully milled and polished white rice must be "enriched" with vitamins B1, B3, and iron. But the form of these nutrients when added back into the processed rice is not the same as in the original unprocessed version, and at least 11 lost nutrients are not replaced in any form even with rice "enrichment."